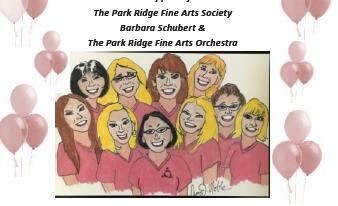 Become a friend of the Park Ridge Fine Arts Society Today! All concerts are at 8 pm in Hodges Park. Admission is FREE. The Stingrays – Sponsored by the Park Ridge Park District. The Stingrays Band playing the greatest hits. The Park Ridge Fine Arts Symphony kicks off the Summer 2019 season with musical masterworks from the Heart of Europe: Mozart’s sparkling Overture to The Marriage of Figaro, Dvořák’s charming Czech Suite, and Beethoven’s ever-popular and delightfully exuberant Symphony No. 7 in A Major. Mark the upcoming Fourth of July holiday with an array of patriotic favorites, from Morton Gould’s American Salute to Tchaikovsky’s 1812 Overture, performed by the Fine Arts Symphony. Works by John Williams, Jerome Kern, Richard Rodgers, and more add to the traditional celebration. Join PRCW for an evening of wonderful music and our annual Gift Basket Raffle. All proceeds benefit future PRFAS concerts. Help PRCW make a difference!!! Celebrate the height of summer – and the Taste of Park Ridge – with lively and colorful orchestral selections performed by the Park Ridge Fine Arts Symphony. The program includes Hugo Alfven’s Midsommarvaka, selections from Mendelssohn’s A Midsummer Night’s Dream, and Dvořák’s beloved Symphony No. 8 in G Major. To culminate the Park Ridge Fine Arts Symphony’s 2019 season, the orchestra presents a showcase of Hollywood Heroes, featuring music by Elmer Bernstein, Klaus Badelt, Hans Zimmer, and (of course) John Williams. Indiana Jones, Batman, Superman, Wonder Woman, and more: you’ll meet them all through the great film scores of modern Hollywood! Always a favorite of Park Ridge audiences, the Brian Patti Big Band presents an evening of Dance Band Hits through the Decades – from the Swing Era to today! This lively program also includes a Salute to the great Aretha Franklin. PRPD BAND – Friday, August 2 2019 – Tino & The Latin Swing Factor – Sponsored by the Park Ridge Park District. Latin band heating up the dance floor with salsa, cumbia and merengue music. Enjoy free salsa lessons 7:15pm – 8:00pm. Check prparks.org for PRPD sponsored concerts at Prospect Park. Hodges Park concerts are sponsored in part by the Music Performance Fund of the American Federation of Musicians as administered by the Chicago Federation of Musicians. Thanks to the following organizations that contribute to making these concerts possible for our community.